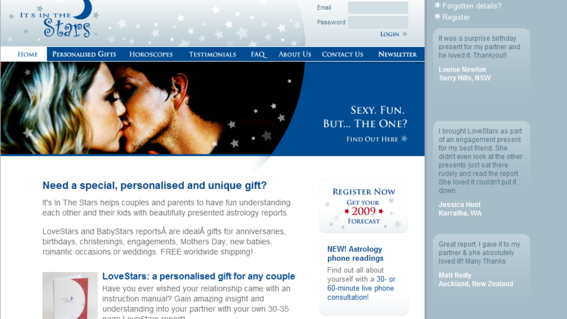 My website Itsinthestarsonline.com was launched on 19 December 2006 after I interviewed seven website developers from May 2006. I had no such delay with my first website business, an online portfolio directory for media professionals called Communicationgame.com, and so I naively thought it would be the same! As the months raced past my planned September launch (they were scrambling to launch it before they closed for Christmas), I probably lost holiday sales. Two developers quoted the earth, one wouldn’t give a quote, one said he had no idea how to build the back-end system, and the fifth was booked until January 2007. The sixth (ironically, a past member of Communicationgame.com) ignored repeated calls, texts, voicemail, visits and return envelopes for my astrology software (and he wouldn’t quote, either) so I couldn’t make any progress. Eventually, as suggested by my accountant father, I found under the local Yellow Pages, debt collectors called Outlaw Collections, two tattooed gentlemen from the local chapter of the Hell’s Angels. Magically, they retrieved my software the same day. The seventh company was wonderful at turning my vision into a website. However, they used a proprietary content management system (CMS) which cost me a fortune and made alterations very expensive. When the chief developer, 2IC developer and project manager left within six weeks of each other in December 2009, I decided to investigate WordPress open-source CMS. Developer interviews began all over again and it took until March 2011 for me to relaunch the website. 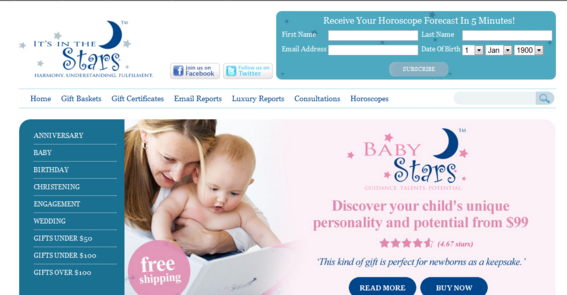 In September 2006 I hired a photographer to take product shots of the BabyStars and LoveStars reports but it never occurred to me to shoot people “reading” the reports to help prospective customers see the products being held and used by people. It took me until May 2009 to organise this. Sales shot up immediately once people could see others interacting with them. I paid to include leaflets offering 15% off the BabyStars reports to be distributed to new mothers in hospital who received gift bags packed with samples, offers and discount vouchers. Never having been a mother, I didn’t realise the timing was poor for parents paying for hospital expenses. As well, many first-time mothers take time to “come up for air”. The offer expiry date ran out within 30 days, not giving them enough time to buy them. Of the 13,000 leaflets, I made 6 sales. Eeek! I hope I’m not the only one who’s made mistakes! Please share yours in the comments below.